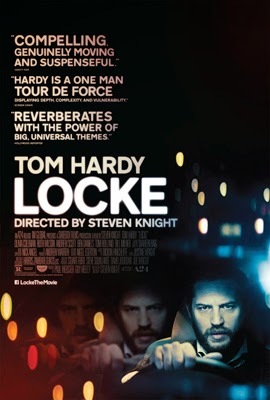 Steven Knight's Locke appears as if it deliberately accepted the challenge to craft an intriguing film from a concept that sounds as unexciting on paper as watching paint dry, or, more accurately when it comes to Ivan Locke (Tom Hardy), as watching cement harden. Taking place entirely within the space of his family-friendly BMW with nothing but domestic and professional drama flooding his speakerphone -- in the dead of night, mind you -- this is a scenario that seems destined to be devoid of conflict or suspense, let alone traditional cinematic presence. 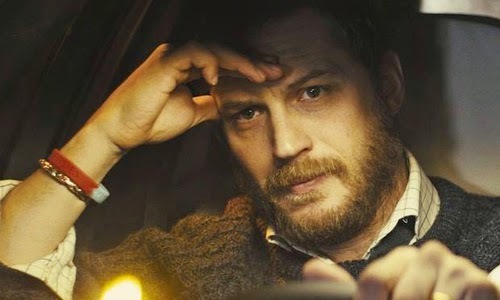 Surprisingly, what takes shape during Ivan's voyage down the highway is an unexpectedly absorbing glimpse at regret, responsibility, and diverting from the mistakes made by one's parents, navigated by a cracking performance from Tom Hardy and a casually experimental visual style. Despite the scenario's trite setup, Locke's a competent depiction of what happens when an psychologically worn-out driver has nothing but loud concerned voices and his strained thoughts filling the space during his drive towards inevitability. On the evening before he's supposed to supervise the pouring of concrete for an immense skyscraper, successful construction engineer Ivan Locke decides to make a right turn instead of left on the way home after receiving a phone call. It's unclear where he's headed at first, only that the situation's critical enough to tear him away from the responsibilities of the high-profile, high-cost construction site, a move that's almost certain to lead to his termination. The film gradually introduces the repercussions of his decision, the responsibility he's dumping on his assistant and the demands of a corporation to remove him, amid his resolute conversations through his car's mobile phone, while also painting a picture of his family who'll also be affected by the unfolding events. It's only later that the story gradually reveals the urgency behind his destination in London, the birth of his illegitimate child, reflecting on his mistakes and how he could've prevented all this from happening in the first place. There's a significant hurdle of frustration Locke has to cross, though, involving the circumstances of Ivan's situation that night, built around this project that could make or break his livelihood getting torpedoed by a personal crisis requiring his immediate attention. The fact that it wouldn't have been such a catastrophic issue had this bombshell gone off some days before or after the concrete pour speaks volumes to the contrived nature of Knight's screenplay, let alone had Ivan been the diligent, straight-shooting construction manager he's purported to be. Alas, the film's deeper musings and suspenseful energy also wouldn't exist without Ivan's abandonment on that precise night: the tension in trying to encourage his stand-in, Donal; quickly phoning in confirmations to workers and city officials; and informing his wife, Katrina (Ruth Wilson), of why he's driving to London instead of coming home to watch a big sports match. Bad things tend to happen at the worst times, sure, but "when it rains, it pours" gets pushed pretty far here. After embracing the forced conceits in how Ivan's world starts to unravel, Locke settles into the driver's seat as a spare, focused study of the man's plummeting mental state, offering an evolving glimpse at his reactions to earth-shifting developments never seen on-screen. The constantly-moving bokeh lights that accompany a nighttime drive down the highway take on a uniquely symbolic visual motif, mirroring Ivan's distraught blur by framing his tired eyes and on-edge, sick facial expressions with the hazy reflections of time and distance passing by. There's something profoundly relatable about the solitude of Ivan's acceleration towards this location that's only going to bring him grief and undesired change, speaking directly to how we attempt to mentally adjust to abrupt events. 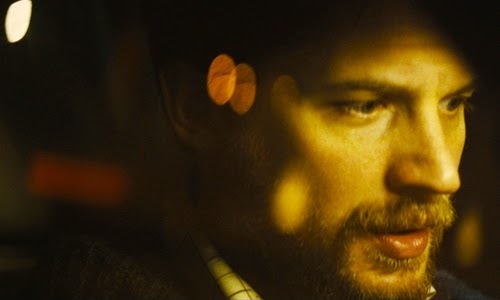 In Locke, writer/director Knight exposes the decline of a man during this ride who's desperately tried to avoid the blunders made by his father, then must deal with the repercussions -- and the regret -- when he's failed to do so. Tom Hardy's performance naturally becomes the film's lifeblood, where the authenticity of Ivan's deceptively prepared tempo crumbling before our eyes transforms into an engaging psychological experience. His peculiarly calm temperament and rhythmic rumble of a voice starts out very self-composed and prepared for the events to follow, then gradually reveals his internal wear and tear with each disruptive inbound and outbound call. Hardy responds to the figurative bumps in the road -- both of the life he's leaving behind and the problem he's driving toward -- with impeccable resonance and complexity, while observing him turns into a moderate philosophical affair in the process, about whether he's respecting his tier of responsibility or if he's being self-destructive in service of his dignity. Despite whether those watching and scrutinizing Ivan's decision agree with him or not, Hardy's projection of the man's turmoil shrewdly convinces that this would be the bed the character would make for himself, informed by his personal code of responsibility. In that, Locke's brisk eighty-five minutes discover what can best be described as raw emotional suspense, creating anticipation out of Ivan's dedication to his professional obligations and his family's perception of him ... even as both rapidly unspool amid nothing but phone calls and conversations with himself. In the time spent with the construction manager, writer/director Knight manages to get those watching invested in seeing Ivan try to tie up the loose ends of a concrete pour, of all things, if for no other reason than to see him earn bits of catharsis --- and, perhaps, to see him suffer the consequence of neglect -- while his life irreparably changes. Once the intense car ride ends and Ivan approaches his destination, however, the film admirably resists the urge to tie up its own loose ends, leaving it largely unclear what'll happen to the mess of Ivan's life. That's perhaps the most compelling thing about Knight's one-man character study: that the version of Locke who slumps into the driver's seat of his BMW won't be the same as the one who steps out of it, as he shouldn't be.